Two views of Saturn captured by NASA's Cassini spacecraft. The left-hand image was taken on July 13, 2001, when Cassini was about 317 million miles (510 million kilometers) from the ringed planet. At right is a shot taken on Sept. 14, 2017, just a day before the probe plowed into Saturn's atmosphere in a mission-ending dive. Over the course of 16 years, Saturn went from little more than a twinkle in the Cassini spacecraft's powerful telescopic eye to the probe's final resting place. 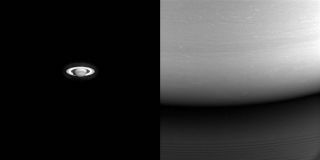 Two newly juxtaposed images remind us of the enormity of that journey, and all the amazing things Cassini learned along the way. Cassini captured one of the images on July 13, 2001, when the spacecraft was 317 million miles (510 million kilometers) from Saturn. The resolution is comparable to that achieved by NASA's Earth-orbiting Hubble Space Telescope, NASA officials wrote in a photo description. The other photo was taken from a distance of 360,000 miles (579,000 km) on Sept. 14, 2017 — one day before Cassini ended its historic mission with an intentional death dive into the ringed planet's thick atmosphere. The image is one of the last that Cassini ever took, and it shows the patch of atmosphere where the probe met its fiery end, as well as some of Saturn's iconic rings, NASA officials wrote. Cassini's observations also strongly suggest that the Saturn satellite Enceladus harbors a potentially habitable ocean of salty liquid water beneath the moon's icy crust. The possible habitability of Titan and Enceladus is the main reason why Cassini dove to its death in September: NASA and the probe's handlers wanted to make sure that Cassini never contaminated either moon with microbes from Earth.